We welcomed the perfect footy conditions with our side strengthened by the inclusion of David ‘Sticks’ Convery, the only change to our line up for the week. Beaumaris were yet to win a game this year, but any side boasting small forward Stephen Milne as well as the inclusion of two-time St Kilda B&F winner Sam Fisher was enough to keep us on edge. We started the game well and the signs were promising that our running game was improving. By quarter time we had kicked four goals to two, with all players contributing. In the second quarter we had 11 shots on goal to three, but unfortunately it only resulted in 4.7. Nevertheless, we extended our lead to 39 points at the main break. What we didn’t anticipate was that our goal kicking would almost come to a complete halt. After having 8.5 on the board, we then went on to kick 1.18 for the remainder of the game. Many of our attempts were either rushed through at the goal line or we simply missed and because of this, it was only a matter of time before Beaumaris gained some momentum. They kicked four unanswered goals early in the last quarter and Milne was instrumental in their play. Fortunately, we settled and finished with a final score of 9.23.77 to 7.12.54. The pleasing aspect was that we had over 30 shots on goal whilst again keeping the opposition to under 60 points. We have really tightened up our defence, but clearly our offensive brand needs to improve. Jason Tutt was outstanding collecting 28 kicks, the Williams boys were in everything whilst our new reliable goal kicker Sean Fisher kicked another bag of three. Vickers, Clinch, Wood, Gotch & Cullinan all had a positive influence whilst Humphrey & Convery once again held our backline together. We face St Bedes-Mentone away next week looking for our fourth win for the season. Another challenge for our boys as we faced another team in good form – Beaumaris sit third on the ladder and are the highest scoring team in the comp. We selected our strongest team for the year and expected a good game from our boys. After an even first quarter, where we trailed by a point, we let ourselves down in the second. They kicked 6.2 to our 1.1 and at the half it was Beauy 7.5 to De La 2.3. We challenged the playing group to lift their intensity. Luke Williams was in everything and the captain Ryan McDonough again led from the front, working extremely hard. Ben Nethersole was involved in getting us back into the game, Jimmy Tran kicked a couple of nice goals and Liam Bisognin was hard at the ball and pulled off an inspiring run-down tackle as well. We were playing our style, switching play at every opportunity. We kicked five goals to two in the third and had worked back to within 22 points at three quarter time. We urged the boys to take the game on. The last quarter was goal for goal and Beauy went on to win the game by an even four goals, 11.8.74 to 7.8 50. So as we look at the game, ten poor minutes of footy in the second quarter where we allowed them to kick 6 goals has cost us. We learn and move onto our next game, confident we can get the points . I’m happy with how we are going, despite the fact we are not winning too many games. There’s lots of positives coming. We will be ok if we keep working hard. We travelled south to take on the newly promoted Parkdale on what was a perfect day for footy. This loomed as a danger game as Parkdale had been playing some really good footy and had been super competitive in all games thus far. We’d had a poor week on the training track and were looking to turn that around by starting the game with high intensity and an aggressive mindset. Our first quarter was blistering. Our pressure around the ball was excellent, our ball movement was quick and we had the game on our terms. We were switched on and playing our brand of footy. We were able to get full reward for effort with a seven goal to one opening quarter setting the up game for us. From then on though, the boys really switched off. Our work rate dropped away, our thirst for the contest diminished and Parkdale were extremely competitive. We seemed flat for the last three quarters but were able to do enough to come away with a comfortable win. We really need to improve our consistency over four quarters and stay mentally switched on for the full two hours. 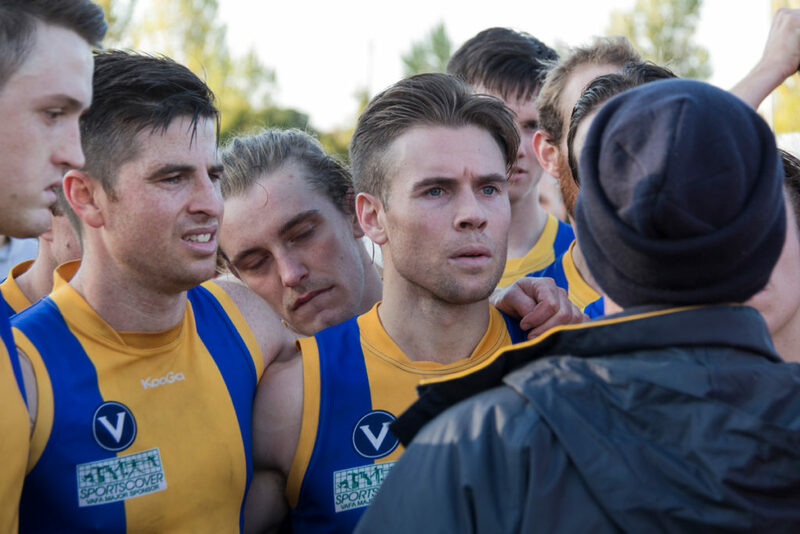 After a forgettable opening half against Fitzroy, the Golds were able to put together a much better second half to run out comfortable winners over the struggling ‘Roys. We had made some changes to the team ostensibly to assist the Colts against old Camberwell, but it still should not have led to such a poor half on a day when the weather and ground were terrific for playing running footy. To be fair, the players did try to get some system going but the game was littered with errors, including kicking out of bounds on the full under no pressure, dropping uncontested marks, a complete lack of run and carry through the lines culminating in stop/start game which played into the hands of our opponents. After some stern words at the main break (where the coach threw all the toys out of the pram) the players redeemed the situation and were able to play some much better footy and record a 90 point win, 15.22.112 to 3.6.24. It should be noted that the coach doesn’t particularly like having to do this, but such was the ineptitude on display it required a bit of shock treatment. Better players across the whole game were hard to find, but we were well served by Cooper Morris who did play well all game and led our attack on the ball with intent that should have been envied by his teammates. After the coaches bake the Golds had some much better second half performances from Remy Cadman, Michael Canny, Jimmy ‘cha cha’ Mullaly, Riley Watson and Mitch Riley along with Chris ‘Swooper’ Northey who kicked three, matched by Liam Manakis. Next week we face St. Bernard’s in what is sure to be a physical and at times ill mannered game as these contests invariably are. The girls were still on a high from last weeks win but quickly realised there was a job ahead of them against Canterbury. The girls were out of the blocks early and off to a great start, kicking two quick goals which set them on course for a great game. The teams put in a fantastic first half, the backline stayed solid and refused to give Canterbury the opportunity for a goal before half time. In the third quarter, Canterbury lifted their intensity and caught us off guard, however we managed to hold them off for the duration by playing our captain loose across the back flank. A fantastic win by a score of 43-20 for Pink lady day at home and the girls throughly enjoyed playing in their pink socks! Another away trip to play Old Camberwell and our preparation was hardly ideal, with a lot of players arriving late and struggling to be ready on time. Despite this we started well and put immediate scoreboard pressure on Old Camberwell by kicking the first four goals. We had a good lead at the first break but there were signs it was going to be a battle as Old Camberwell were beginning to hit their straps. The second quarter saw our lead reduced to a kick and the third quarter saw a desperate hard in and under close physical game of footy played by both sides. The game was on the line at the last break with less than a kick in it. Despite the last two torrid quarters, we still had some run and desire for the contest and managed to dominate possession early and kick a couple of goals. The boys kept at it and played a terrific last quarter to win by 24 points, 12.9.81 to 8.9.57. We get to play at home next week and looking forward to a solid week on the track. The Warriors were back at Jordan Reserve for a game against Old Trinity, the team that pipped us in the final minutes for the 2016 premiership. There was a score to settle from our end and given that we were missing the majority of our senior leaders, we went in with a team that was given an opportunity to stand up in the absence of many of those that had done most of the heavy lifting over the past month. The team was comprised of a number of players coming down from the twos, people who had been role players in the opening rounds and a handful of first gamers for the lifestyle football program. Any concerns that we were undermanned were quickly quashed when we moved the ball by hand and foot up the ground cleanly controlling the tempo of the game. By half time we’d had the run of the game, but hadn’t put Trinity away. The game was a real arm wrestle for the three and a half quarters, with only two goals separating the teams with 10 minutes to play in the final term. But the De La boys played like a team that had been together for 10 seasons and every player on the field stepped up as leaders when called upon. We kicked the last four goals of the game to enjoy the final minutes of a most satisfying win, 13.6.84 to 7.6.48. It was a true team effort in every sense of the word, but standouts were Jack Hanley with a breakout game on the ball and resting up forward kicking four goals, Kieran Grant sneaking forward and settling in nicely to kick four and take a contender for mark of the year, Beau Hill did what he does best, ruining the days of Trinity’s key forwards and was well supported by Sefton McGraw. Harry Jarvis, Dan Pendergast were solid all over the ground, Jordi Sahely threw his weight around and used his speed in a damaging debut and Mark Breda and Shane Griffin teamed up well around the ground at stoppages. De La now sits 5-0 and take on the also undefeated Ajax in a blockbuster under lights this Monday evening at Harry Trott Oval, St Kilda. The Dino’s next game is at home on 21 May against Old Scotch-South Yarra. Supporters are encouraged to jump on the bandwagon and cheer them on!